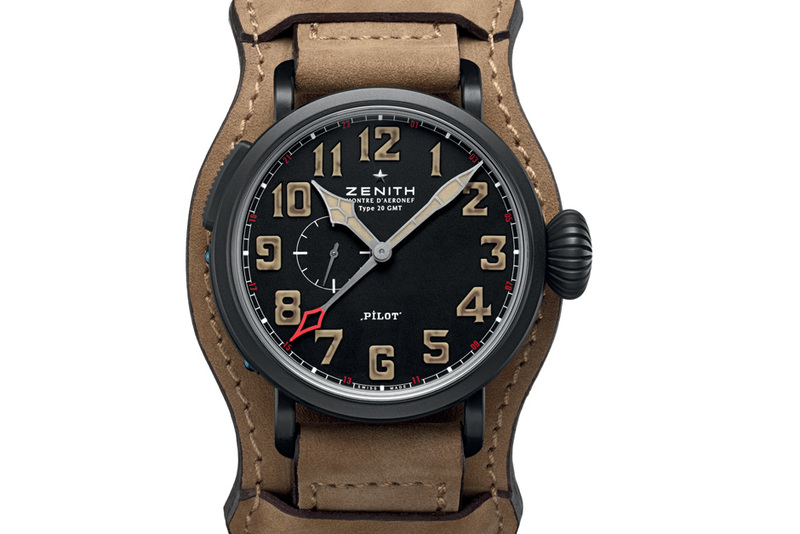 This watch from Zenith honors the first flight by the Wright brothers back in 1903 when they took their twin propeller aircraft named “Flyer” for its maiden journey on the beach at Kitty Hawk. This watch is made to 1,903 pieces paying homage to the year that changed the world as we know it. This watch shares many of the aesthetic qualities of the Montre D’Aeronef collection but is set apart by its distinctive beige suede leather strap, designed to add to the vintage feel of this aviation themed timepiece. On the reverse side of the suede leather strap is a heat embossed emblem of Zenith’s Flying Instruments, and their original logo. This timepiece will be officially revealed to the world at Baselworld in about a week. The case of the Zenith Pilot Montre D’Aeronef Type 20 GMT 1903 is crafted from black DLC titanium with generous case dimensions of 48mm, excluding the prominent onion styled main crown. To match the large diameter, this watch features a thick case measuring in at 15.8mm.Though this watch is quite large, it isn’t heave in the least due to the titanium used in its construction. The limited edition number appears on a plate on the left side of the case (XXXX/1903). This model is water resistant to 100 meters. The dial is sandblasted a total of 5 times and features large, easily readable Arabic numerals. The Arabic numerals are comprised of Radium and Super-LumiNova, which offer exceptional lume for the reading of the time under conditions of poor light quality. In the style of aviation themed watches, this model also carries large hour and minute hands and a GMT indicator for the second time zone, distinguished by a red skeletonized tip. The second time zone can be advanced one hour by a pusher located at the 10 position on the case. At 9 o’clock, there is a continuous seconds register. Beneath the solid case back featuring a depiction of the aircraft, is a self-winding caliber – the Elite 693. This superbly crafted movement carries a power reserve of 50 hours when fully wound and vibrates at 28,800 VpH. Although the movement is hidden from view, Zenith still decorates the oscillating weight with a Cotes de Genève pattern.